He joined the MC for many reasons. To be able to financially take care of his mother and sisters, to have fun, to let loose, to meet women. But only casually. Only for a night or two. He wasn’t ready to settle down. Until one day, when the president gives him a job. Just drop the guns, get the money, come home. Don’t f— it up. Except everything goes to hell. And he has just six weeks to find the woman who stole the guns, work with her to track down replacements, and try not to get too distracted. 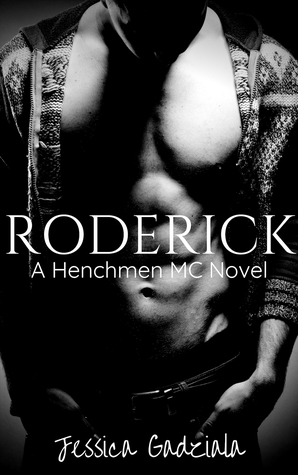 Roderick is the latest installment in the Henchmen series by Jessica Gadziala. It started a little slower then previous books. For some reason I didn’t really connect with Livvy straight of the bat. In fact I wasn’t sure if I even liked her that much. There wasn’t too much involvement with the actually Henchmen themselves and I missed this banter that would normally go on and I also missed the other characters popping in and out. I did love Cam and Astrid, I look forward to seeing if there will be a book for Cam. Overall it was enjoyable and I would defiantly recommend reading it.